In 2002 I wrote an article for Metropolis about the last days of the beach community at Crystal Cove, California, where I spent my childhood summers. While reporting the piece, I reconnected with Laura Davick, a family friend who was leading an effort to preserve the cove’s historic beach houses — even if residents like herself had to move out. We joined forces with local plein air painter Meriam Braselle and Chronicle Books to publish Crystal Cove Cottages: Islands in Time on the California Coast. A Los Angeles Times bestseller, the first edition of Cottages sold more than 18,000 copies. 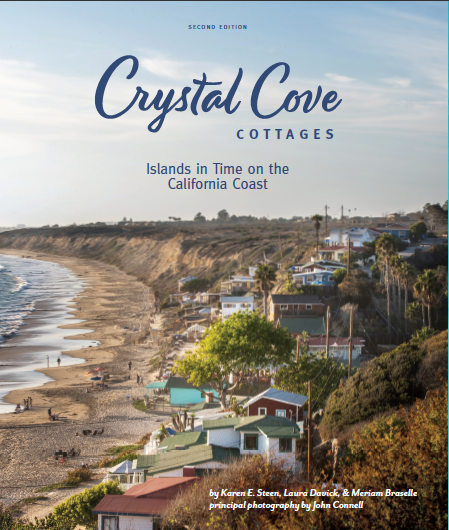 In 2017 we published a second edition; all proceeds now go to the Crystal Cove Conservancy to fund restoration of the cottages and educational programs at Crystal Cove State Park. Tucked between the housing developments and golf courses of the Orange County coast lies a small settlement of rustic beach cottages seemingly frozen in time. Crystal Cove Cottages is the first history of this uniquely preserved spot, which has lured artists and vacationers since the 1920s. Listed on the National Register of Historic Places as “the last intact example of California beach vernacular architecture,” Crystal Cove is now a California state park. The history of the cove parallels the story of California: it has been a set location for silent filmmakers, a Prohibition rum-runners’ hideout, luau-party headquarters for 1950s tent campers, and home base of a vibrant landscape-painting community. Today the cottages — as part of Crystal Cove State Park — have been restored to their appearance in the 1940s-1960s era and are open to the public for overnight rental. Crystal Cove Cottages celebrates both the romantic history of this secret seaside enclave and its reinvention as a public treasure for future generations.